I want to caveat that you should take all precaution in using the Instant Pot and you should follow all instructions as presented. 2. I didn't read the note about not exceeding the 50% mark for stuff that expands. That I don't quite get. What is the point of getting a 6 Qt instant pot to replace a 6Qt crock pot if I can't use the full 6Qts?!! I feel like I should have been told. I wouldn't have wanted an 8 Qt because I'd be scraping my 1-2 person portions of Jook off the bottom of a too big pot. 1. I thoroughly presoaked the beans from the early evening to the morning on the counter, not the fridge. In the morning, there was no water left and the beans which were flat, an inch below the lip of the big bowl were a mound above the lip. I added more water and I did other stuff while waiting. 2. Navy beans don't expand that much. 3. I don't like heavily salted nor sweet food. I had put the spices for the 1lb version of a few different recipes so it was fine for me, a tad bland for my husband who added Green Tobasco, and he thought it was great. I added Chipotle hot sauce and it was good too. I was a bit nervous when I realised I had passed the 50% mark of the Inner Pot but I hadn't passed the 2/3 mark. I was having visions of the beans pushing up against the lid and either clogging the venting thing or exploding. I don't know why I didn't just stop it. It was well into the cook by the time I realised it and maybe morbid curiosity. Don't try that at home! In the end, it was fine. Acutally, the final product was exactly, if not slightly below the level in the pot that I had started the cooking at. Which I think, goes to the good pre-soak of the beans. So to be honest, I will probably do the same again but with the appropriate amount of spices. But the water was even okay because of the presoak. They weren't dry and I didn't have to add more water!!!! The recipe below is what I did. And it was 'fine' as far basic taste. Below the main ingredient list, I will put what I WILL DO next time. 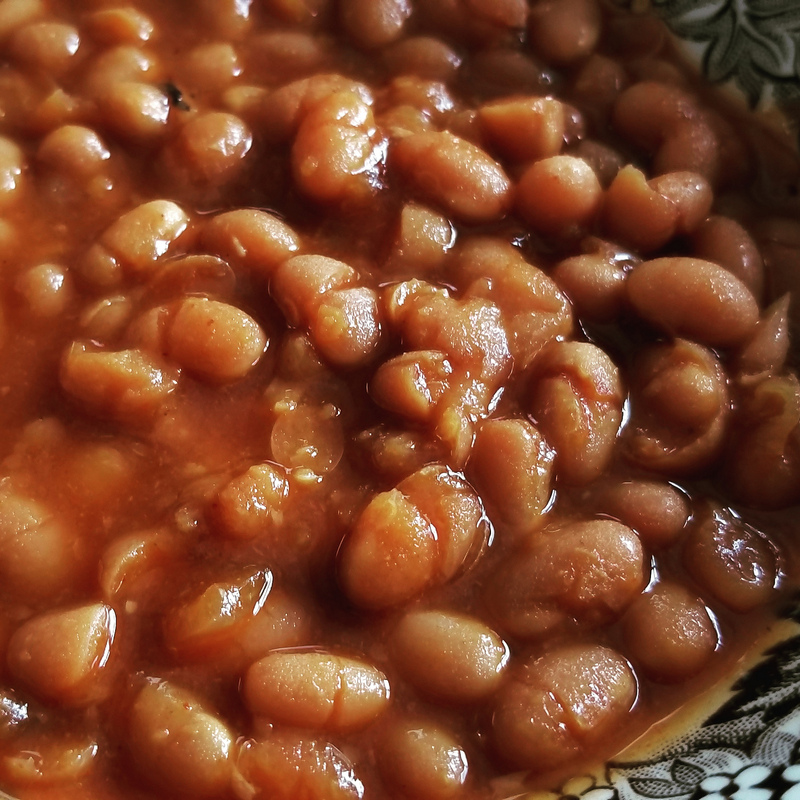 2 lbs or one bag of Navy Beans, rinsed throughly and soaked for at least 10-12 hours on the counter with at least 2 inches of water over the beans all the time. Discard any discoloured or rotten beans. 1 t Olive Oil (or leave out and use 1/4 broth... or skip the prefry all together. Drain and rinse the beans one last time, the morning of. Open the Instant Pot and put on the Sautée function. A bunch (dozens) of recipes I skimmed all said to do this so for the first go around, I followed along. Next time, it will be a set it and forget it approach. The Onions will melt away anyway... also, my toddler woke up complaining that the house smelled of onions :D.
Add 1 tsp of Oil and the Onions. Sautee until softened, about 3-5 minutes. Add the beans, spices and the Water. Set to the Bean/Stew function and set to cook to 60 minutes and after that Natural Release. 1 T Cider Vinegar (maybe it's because ours is old? but it added a funky background flavour that my husband did not like) Ricardo uses Balsamic BUT I don't want to mix up recipes just yet. Because he also uses ketchup instead of Tomato Paste which I think would make it too sweet. Disclaimer, use your Instant Pot as directed! This isn't the hurt locker! It ain't worth it for beans.